Farm subsidies are not socialism or welfare according to these politicians. If you are receiving subsidies, that is socialism! Is it any coincidence that the majority of farm subsidies go to large corporate farmers? To see which farms are receiving the most money in your area, check out: https://farm.ewg.org/ . 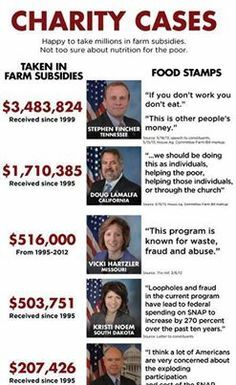 It lists every farmer and how much taxpayer aid he or she has received.